Hip stretches are a good way to improve hip mobility and hip muscle funtion. Workouts that involve hip training should include some type of flexibility program for stretching the hips. Read on to learn more about the best stretches for the hip muscles. The IT band is a commonly injured muscle with sports activities. From IT band friction syndrome, or snapping hip, to distal IT band tendonitis, poor flexibility of this muscle can lead to problems. Stretching the IT band can be tricky, as it is a muscle that can be hard to isolate. The standing IT band stretch is one of the easiest and best ways to stretch this muscle. To start, cross your right foot over in front of the left. Most of your weight should be on your left foot. Next, reach your right hand overhead, and lean as far as you can to your left. Push your hips out while you are reaching overhead. You should feel a stretch along the outside of your right hip, as well as in the outside of your lower back. Make sure that you don't twist, and that you remain straight from your trunk to your lower extremity. The standing hip flexor stretch is a great way to improve muscle flexibility and mobility restrictions of the hip. 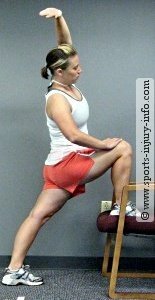 To stretch the hip flexor actively, start with placing your foot on a chair or some ofther structure about the height of your knee to waist. 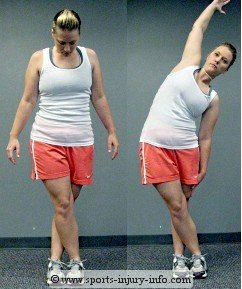 Next, raise your opposite arm overhead. Lean your hips towards the chair while keeping your back straight. Reach sideways with your arm. You should feel a stretch in the front of your hip. Hold for 2-3 seconds, and then return to the starting position. Repeat 5-10 times. 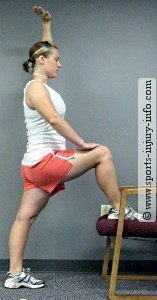 Hip flexor and iliotibial band stretching is important for treating and preventing injuries in the hips. They are two very common hip stretches, and should be part of any flexibility program or hip training program. 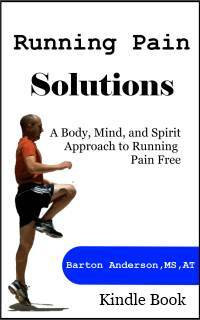 Download a free copy of Flexibility Solutions: Lower Body - You will learn some of the best stretches for the lower body. Step by step instructions with pictures, this whole program can be done in as little as 10 minutes a day - and best of all, its free! Just use the sign up form on the top right of the page.